Roberta Lusa graduated with a B.Pharm from the University of Queensland. Since then she has spent half of her career in Pharmacy and half in Pharmaceutical Industry. Her time as a pharmacist has been in both retail and hospital pharmacy in Australia and abroad with wide-ranging experiences including setting up two cancer care units-one in Saudi Arabia- and as chief pharmacist setting up a hospital pharmacy in Asia. Roberta’s career in the pharmaceutical industry has taken her around the world, spending many years abroad (Italy, France, Switzerland, China) as a clinical researcher in the areas of oncology, dermatology, respiratory, transplant, cardiology and virology. A significant role was as the global clinical development project coordinator working on the first protease inhibitor, Saquinavir® used in the treatment of HIV from drug discovery to global registration. In this role, Roberta collaborated closely with the American FDA on approval of this breakthrough anti-HIV drug still in use throughout the world today. Another noteworthy responsibility was as Chief Pharmacist in Vietnam, setting up the first international standard hospital in Saigon, overseeing all pharmacy functions at the Franco-Vietnamese Hospital where much of her daily work was undertaken in French. Roberta also worked with the University of Ho Chi Minh Pharmacy School to introduce clinical pharmacy into the B. Pharm curriculum. Due to her extensive experience abroad of over 20 years, working in a variety of roles within the pharmaceutical industry, Roberta has a strong cross-cultural awareness and an extensive global network. Roberta can now communicate in 7 languages at various levels. Currently Roberta works at both Queensland Health (QH) and University of Qld (UQ) School of Pharmacy (SoP). 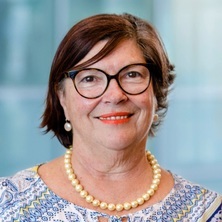 At QH she plays a lead role in extending clinical trials to the rural and remote areas of Qld through an initiative called Teletrials where she is principal author of the Standard Operating Procedures. Her primary roles at UQ are the development of the business case for a Master of Pharmaceutical Industry Practice and to investigate, identify and activate opportunities for industry placements for the School’s PhD, ITP and 4th year UG students. Roberta will also contribute to teaching and learning in multiple forums throughout the School delivering material in relation to the pharmaceutical industry (Pharmacovigilance, Good Manufacturing Practice, Good Clinical Practice and Good Laboratory Practice, Clinical R&D, Regulatory and Drug Marketing strategies, etc.) on both domestic and international stages; assist with identifying and accessing pharmaceutical industry partnerships and grant opportunities; build and foster the School’s relationships with alumni, industry, government departments, professional bodies and the wider community.